Shortly before the dearly missed winter break began, the student government of our UC compatriot, UC Santa Cruz, released a statement condemning the University of California and its effort to ramp up enrollment. Over-enrollment, as many UC San Diego students would agree, cramps classrooms, housing, resource centers, and transportation. A timely coincidence, UCSD and other UC institutions issued an email lauding another year of record-breaking application numbers. Their thrill comes from the knowledge that there is an ever-widening pool of demand to fit the ever-stretching supply of admissions. As it turns out, plenty of studies show that increasing enrollment numbers leads to a healthy supply of capital, but when done too quickly, a university is left simply with cramping, bloating, and a resolution from its own students opposing its actions. Of course, UCSD took the opportunity to hold up these numbers as proof of its commitment to expand higher education to the black and brown masses, but these groups are the first to suffer the consequences of a population which grows more quickly than do its resources. UC campuses, due to their great size and even larger demand from prospective students, operate with a considerable chunk of capital. Buffing up enrollment has allowed for more diverse curricula, increased spending on research, development of extracurriculars, and expanded academic resource centers. However their size and demand also lead to housing shortages, food insecurity, difficulty accessing resources, and tensions with the surrounding communities. Expanding enrollment offers many tangible benefits, but only when done properly. One study shows that when enrollment increases too rapidly, a whole host of indirect effects stifle the ambitions a university might have for ameliorating higher education. The student-to-faculty ratio goes out of whack, resulting in poorer performance. Psychological and academic resources become so crowded that they can barely meet the basic needs of students. What’s worse is that universities often call for diversity when expanding higher education, but these marginalized groups are the first to feel the impact of crowding. It should be news to no one that black and Hispanic people are heavily underrepresented in higher education. These groups have markedly lower participation in every stage of higher education; they are less likely to apply to higher education, less likely to be accepted, less likely to have access to necessary academic and personal resources, and less likely to ever get a degree when compared to white and Asian students. Black and Hispanic students tend to lack the socioeconomic advantages from which white and Asian students might benefit, including the ability to buy into external academic and psychological resources. So when spending per student is reduced due to over-enrollment, and when resource centers spread too thin, these groups are the most immediately affected. This results in markedly lower enrollment and retention rates for these groups. Even though the trend usually dictates that enhancing enrollment efforts yields a more diverse campus, the exact opposite arises when the expansion of resources is not proportional. The inconsistent link between heavier enrollment and diversity is especially obvious in UCSD’s enrollment statistics. At a school where nearly 37 percent of applicants identified as Latino in the last year, only around 3 percent of the enrolled class of first-year freshmen were Latino, and around 12 percent were Mexican. Asian and white students consistently constitute 60-73 percent of incoming freshman, but UCSD instead chooses to note loaded statistics about increases in populations of some minority groups. For example, African-American students will be happy to know that the 2016 freshman class ascended from its usual 1-2 percent of that year’s first-time students to a whopping 3 percent. UCSD made sure to include that this represents a 250 percent increase in that group’s enrollment. 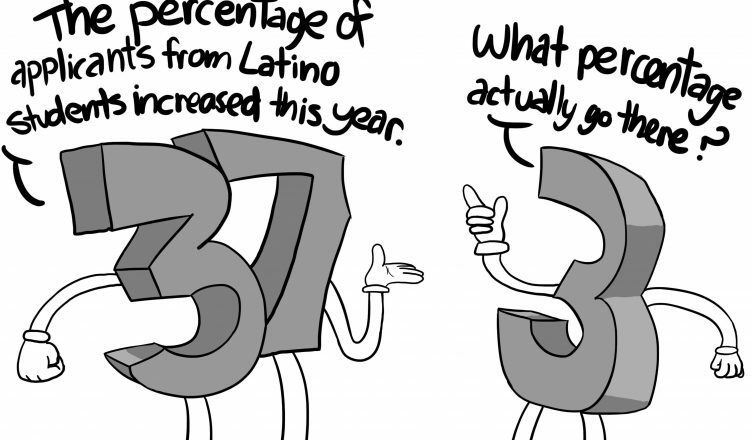 While it is true that black and Hispanic students more often opt to enroll in two-year colleges prior to transferring to four-year universities, these numbers reflect more on the general effort to increase enrollment than they do on the efforts of UCSD to break down barriers to higher education. Diversity does not mean cramming as many people of color in a room as possible to disguise the homogeneity; diversity is inclusion which ignores — or challenges — obstacles associated with socioeconomic level. To its credit, once a student of color arrives on campus, UCSD makes the effort to support them. The Obama administration — aka the good ol’ days — outlined specific policies which universities could undertake to promote diversity on their campuses, many of which UCSD instituted. These include: providing resource centers which address the needs of specific minority groups, hiring diverse faculty at all levels of the institution so as to reflect the student body in the staff and curriculum, and programs that increase cultural competency (e.g. Diversity, Equity, and Inclusion Requirement, Dimensions of Culture courses, Making of the Modern World, etc.). But, as UCSC students noted in their resolution, all of these efforts are in vain if there are too many students trying to access them. Rather than building a diverse student body with the proper support to succeed, some schools simply foster cramped campuses that stretch their resources too thin. To an extent, there is only so much a university can hope for when aiming to create a more holistic and inclusive system; institutional barriers to higher education exist outside of the university’s control. However, the easiest method for accommodating the concerns students have is to put a freeze on admission numbers. Instead of hoping that the increase in funding that comes from an influx of students will solve all problems, the UC system needs to focus on appropriating the funding it already receives to tackle the issues faced by its already bloated campuses.